Dmitri Smirnov was born in 1948, so he’s from that generation of Soviet composers who came to age during the decaying days of the empire and the stultified Brezhnev years, among whom Denisov, Schnittke and Gubaidulina, members of a generation born 15 years earlier, are the figureheads. Whether it was easy or not, whether they did it in the open or in concealment, these people embraced modernism, and weren’t just slaves to the trends that dominated in the West, they invented their own, original brand of modern music. Not entirely in concealment, it seems: they did get recorded by the national label Melodiya. On the other hand, his bio on Wikipedia reminds that in 1979 Smirnov was “blacklisted as one of the “Khrennikov’s Seven” at the Sixth Congress of the Union of Soviet Composers for unapproved participation in some festivals of Soviet music in the West” – the other six being Smirnov’s wife Elena Firsova, Alexander Knaifel, Viktor Suslin, Vyacheslav Artyomov, Gubaidulina and Denisov. In 1991, the year of the demise of the Soviet Union, Smirnov and Firsova established in England and later acquired the British citizenship. Some of those once-modernist Soviet composers, like Pärt or Silvestrov, later reneged and embraced a kind of mystical neo-simplicity, but not all, not Schnittke, not Denisov, not Gubaidulina – and not Smirnov. This CD, published in 2002, offers a good illustration of his stylistic evolution, as it gathers early pieces, from 1977 and 1978, and compositions that were recent when the disc came out, composed from 1997 and 2000. While the music is often agonizingly vehement and pounding, there is nothing abstract to it in the manner of serialism or post-serialism, Smirnov never loses touch with melody and expression. But, whether it is typical of Smirnov’s expressive outlook in general or not, all the works feature here don’t show much variety in the expression either: the music is always grim, mourning, rising to climaxes of violent and agonized vehemence. The 1977 Trio for piano, violin and cello (tracks 6-8) shows fine timbral invention, moments of great sonic subtlety, with the use of mysterious and atmospheric glissandi, quarter-tone intervals and harmonics, pointillistic pizzicati, evoking the impression of lost souls. But the music isn’t just sonic effects, and the third movement opens for instance with an aching melody played very softly, as pain impossible to express or souls drifting away in nothingness. But the Trio develops also moments of great vehemence, introduced in the first movement when the piano plays in the highest and most crystal-hard registers over hushed string harmonics then descends pounding into the lowest, and that same vehemence is much in evidence again in the often screaming second movement. The music is highly expressive in its expressionistic and agonized manner. Shostakovich’s maverick student Galina Ustvolskaya comes to mind. Likewise, although it has its thorny and vehement moments, the Sonata for Cello and Piano, from 1978, remains always anchored in melody (however angular) and expression – again grim and somber. Jump 20 years, and in fact I don’t hear so much of a stylistic or expressive difference. If any, it might be that Smirnov uses less of those sonic effects and playing modes, glissandi and all, he’s more about pure expression obtained through more rarefied means. But he hasn’t entirely abandoned those effects either, and anyway the expression remains very grim, mourning and agonized – no wonder, since the Violin and Piano Sonata (1998), Elegy (1997) and Postlude (1998) are all dirges, to the memory of, respectively, Firsova’s father, the physicist Oleg Smirnov, Denisov (who was Smirnov’s teacher in instrumentation) and Schnittke. Postlude and the Violin-Piano Sonata share many similar traits, a reliance on “pure” melody, however aching and agonized but occasionally elegiac, the occasional use of sonic effects like sul ponticello and harmonic tremolos, to great expressive effect. There are again many moments of expressive vehemence in the Sonata, and fine invention in sound and timbre in the second half of the last movement, but it sounds overall like the most traditional work on the CD, the one that is at times the most anonymously “modernist”. Postlude climaxes in something like screams of despair, or refusal, before receding into the oblivion of harmonics increasingly pianissimo were the mechanics of bow against strings are heard more than the actual vibration of the strings. The same gesture concludes the Violin-Piano Sonata. Again Elegy to the memory of Denisov, for solo cello and three crystal glasses, is somber, mourning, vehement, stylistically post-Shostakovich but exploring even more outward regions of sound and perhaps the soul, until the harmonics of the cello become undistinguishable from those of the crystal glass. It would fit well in a program with Crumb’s solo cello Sonata. 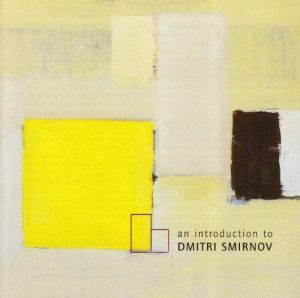 In that context the Piano Sonata, Smirnov’s fourth, “String of Destiny”, the most recent piece on the CD (2000), stands out, if only because of the timbral nature of the instrument. Here the dramatic impact lies not on agonized melody whispered, sung or screamed by strings, but on the rise from hushed resonance to flurry of notes and massive explosions of sound, still with depressed sustaining pedal. It evokes a more modern Scriabin without the mysticism and aching chromatic harmonies. On my copy, a very strange thing happens at the end of the last track, the Postule for solo violin. It ends at 11:35, as announced on the track listing (11:40), but at 11:41, without a break in the track, a new piece begins, for piano, in which the attentive listener will recognize the same Piano Sonata as on track 2. What a production blunder! he will first think – until, at the end, Smirnov’s own voice announces: “this was String of Destiny, Sonata number four, dedicated to my daughter Alissa Firsova, played by Alissa Firsova”. Nothing announces that, Alissa and the alternative version of the Sonata are nowhere mentioned on the CD’s back cover or booklet, the only hint is the 20+ minute duration of the last track. It’s the mystery bonus, for those who sat and listened to the end. The sonic perspective is exactly the same as on the “disclosed” recording of the Sonata, as if it had been recorded on the same piano, with same microphone placement, but while the two readings are quite similar, there are unmistakable differences… In a private correspondence following the publication of this review, the composer indicated that his daughter was fifteen then and recorded the Sonata, which she knew by heart, in one take. Partita op. 43 for solo violin by the same performer, published in 1995 on Fish Ear FECD621 (under the general title “Winter Journey”), with pieces of Jolivet, Henze (Etude Philharmonique, also on the previous CD), Sculthorpe, David Matthews (the title piece), Strauss, Schulhoff, Nigel Clarke, for which I cannot find any commercial listing. Serenade op. 34 for oboe, saxophone and cello and Tiriel op. 41b for saxophone, baritone and piano on Visto 3703, “proyecto Moskva”, with works of Gubaidulina, Firsova and Sergey Pavlenko. Contrary to what you’d think, this is not a Russian CD by one originated in Spain, and I haven’t found a commercial listing. The Second String Quartet (and Firsova’s Third) by the Chilingirian Quartet, originally on Conifer 75605 51252-2, reissued on RCA/Catalyst 82876 64283-2. In the private correspondence mentioned above, the composer had indicated that the choral works featured on two CDs from Northern Flowers, “Our Lady’s Rejoicing in Sorrow” and “Dmitry Smirnov, Sergei Banevich. Choral Works”, were not by him but by another Dmitri Smirnov from St. Petersburg. 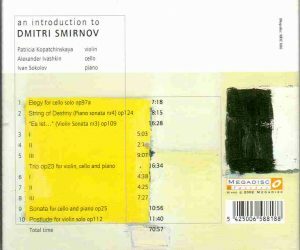 The Smirnov page of Onno van Rijen’s Soviet Composers website mentions many CDs on a Meladina label, but that is Smirnov’s own label and they are, or were, promotional CDs, not commercialized. Smirnov’s website is inaccessible at the moment. One consolation is that many works of Smirnov can be listened to on YouTube.